Well, there is more than one best thing about fall. More like 11 and I swear I set out to make it a tenner, but it happened and I let it slide, because sometimes you just need to let stuff go. Let’s start off with the most important thing: holiday-ing. You haven’t even lost your sun tan yet and you’re planning your next vacation. And that makes you purr inside, don’t even try to deny it. Be it a city break or a New Year’s Eve get away, you’re browsing, asking, chatting and planning. You spend more time inside: you get to make your apartment cuter, you get to finally spend 2 hours measuring your wall, drilling holes and hanging those 15 frames you bought in May, for which you simply didn’t have the time. Here’s my list of stuff for le home. 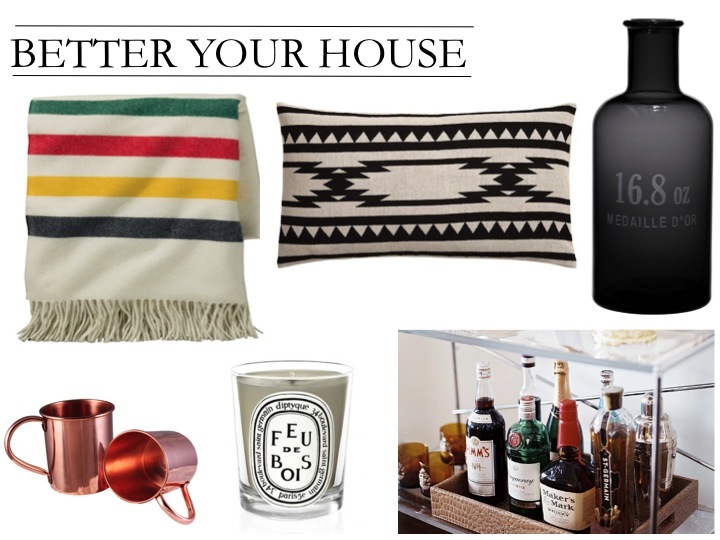 Pendelton blanket, Moscow Mule cooper mugs, H&M Home pillow case& vase, and the perfect bar. It’s cooler now. Which is what you have been praying for, is it not? You’re making a list and checking it twice, dropping hints left and right, because Christams is coming and, if you’ve been a really good girl, your birthday is coming up too. Below are a few hints boys and girls, mothers, fathers, boyfriends, lovers ( HA! Just wanted to see if you were paying attention! ), kittens (ze pet is expected to chip in, no free rides here) and anyone and everyone. Daniel Wellington watch, Jimmy Choo booties, Gucci iPad mini sleeve (and the insides), Vetyverio Diptyque perfume, Irina Marinescu sweater and a slim, thin, never-take-it-off bracelet. It’s also great that it’s fall and not December 23rd, because if you’re an insane maniac you’re probably already planning your Christmas dinner party. Making the menu and thinking about the decor takes about a month, because you’re also doing a bunch of other stuff in between and you , OH MY GOD, SHOES. That’s why it takes you that long. Isabel Marant for H&M is a great reason to not want to sleep all through November. You get to write on that blog of yours, or you get to start it. You find out what the deal is with Pinterest. You put in an order on Amazon and check the mailbox daily to see if there’s a slip inside. Because you remembered the importance of reading. Again. 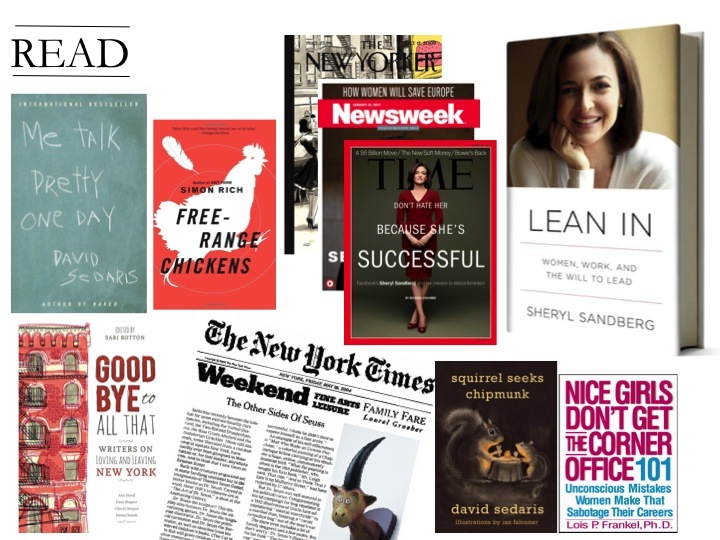 David Sedaris, Simon Rich because they are great on Sundays, the usuals (NYT, Time, New Yorker& Newsweek) because they give you amazing conversation material for your next dinner party and the feminists (Sheryl Sandberg& Lois Frankel) ‘cuz that glass ceiling isn’t just in their head. You get to go shopping again, and it feels fresh and new and exciting. And admit it, you haven’t felt that in at least 4 months. Fashion month starts and gets by and you make plans for spring, which you’ll forget in about 10 days, because warm weather is no longer inspiring. You get to wear oversized sweaters and leggings and let’s not fool around ladies: this is a trend we’ll be riding hard until it’s dead and gone because all you want in winter is to be warm and comfortable. You get to drink red wine, which was gross back when it was 40+ outside. You pull a blanket over your legs. You kick a bunch of dried leaves on your way to work. You stay inside and you don’t have the acute feeling of missing out on something massively fun. You charge up for next summer.